Presbycusis may occur due to damage to different parts of the auditory systems. Based on the source of damage, four types of presbycusis are recognized: sensory, neural, metabolic (or strial), and cochlear conductive (123,130). The onset of presbycusis may be any time from the third to sixth decade of life, depending on type. Individuals suffering from these disturbances show distinct and differing audiograms (Fig. 8), which are clinically used to diagnose types of impairment. More complicated audiograms are produced when the pathology involves a combination of these disorders (Fig. 8). The standard type of presbycusis with hearing loss at high frequency is often associated with neural or sensory presbycusis (Fig. 8B,C). Individuals with sensory presbycusis show a major and sudden loss of hearing in the high-frequency range (4 kHz), indicating a selective deficit in transduction mechanisms of high-frequency sounds (Fig. 8B). Speech discrimination is normal. Although the hearing deficit is observed from middle age, the histopatho-logical problems believed to be mainly associated with the cochlear hair cells may start much earlier. Cochleas of humans with sensory presbycusis typically show loss of outer hair cells and less often of the inner hair cells of the organ of Corti (Fig. 8A) (123,130). The loss is diffuse or patchy and is mainly limited to the first quadrant of the cochlea's lower basal turn. This part of the cochlea is specialized for detection of high-frequency sounds. The affected sensory hair cells and other supporting cells (Hensen's and Claudius' cells) show accumulation of the aging pigment lipofuscin, the amount of which corresponds with the degree of sensory deficits. In this disorder, hearing of pure tones for all frequencies are affected, but the extent of hearing loss increases with increasing frequency of sound, the deficit being about 40 dB at 1 kHz and nearly 100 dB for high frequencies (>8kHz) (Fig. 8C). As a result, speech discrimination is reduced to 60% of the normal level. In the aging auditory system, the first-order sensory neurons are adversely affected. This damage ranges from synaptic structures between the hair cells and the dendrites of the auditory nerve fibers, accumulation of lipofuscin, to signs of degeneration in the cell bodies of the spiral ganglion neurons. Disruption of the myelin sheath of the auditory nerve fibers can cause disordered transmission, even if the nerve cells were present (123,132). FIGURE 7 Amount of hearing loss in decibels for different pure tones in various age groups of men and women. Note a greater loss in higher frequencies and older ages and a more pronounced hearing loss in men. Source: From Ref. 28, based on the original data of Ref. 124.
the vascular supply to the cochlea (stria vascularis) (122,123, 130). The extent of hearing loss is correlated to the degree of degeneration in stria vascularis (123). In this type (also called mechanical presbycusis), the audiogram indicates some hearing loss at all frequencies, with the loss magnitude increasing linearly with increasing tone frequency (see curve #2 in Fig. 8E). The magnitude of hearing loss is about half of that seen in the neural type, and speech discrimination is only slightly affected in most cases (96% of normal). This type of presbycusis is believed to be due to changes in the mechanical properties of cochlea's basilar membrane, hence its other name, "mechanical presbycusis." The basilar membrane is markedly thickened, especially at the basal cochlea, and shows calcified, hyaline, or fatty deposits. There is usually no change in the hair cells and sensory neurons (130). In a recent study, Chen et al. (133) reassessed the cases of "indeterminate presbycusis" as classified by Schuknecht (122,132) originally, i.e., those not due to changes in basement membrane thickness. In their retrospective quantitative analysis of neuritis, neurons, peripheral hair cells, and the stria vascularis in people who had presbycusis, they found that loss of peripheral dendrites (neurites) of the spiral ganglion cells corresponded better to a more gradual downward-sloping audiogram than presbycusis with hair cell loss (sensory presbycusis). This phenomenon was termed "neuritic presby-cusis" (133). A 20-year-long study of pure-tone audiometry by Kim et al. (134) on 6000 Koreans, aged 65 years and older, found a high incidence (~40%) of presbycusis as well as a significant difference in hearing threshold between men and women (males > females). Megighian et al. (126) analyzed the presby-cusis data of over 13,000 Italian males and females, aged 60 and over, living in either city or rural environments in the Veneto region, and found typical trends of the audiometric curve in presbycusis. 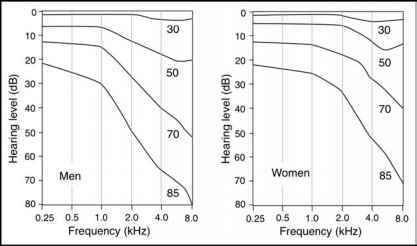 Hearing loss was less severe in females than males, especially at higher auditory frequencies. No significant differences emerged between subjects from the urban or the rural environments. According to Bazargan et al. (135), poor hearing among aged African Americans was associated with a decreased level of psychological well-being, but this relationship was mediated by the effects of hearing loss on ability to function. Poor vision, on the other hand, is independently associated with a decreased evaluative level of well-being.